Camp fires, wildlife, spacious pitches, a secluded meadow, games pitches, trees to climb and swing in. The Sunny Field campsite is a chance for you and your family to connect with nature. A sense of discovery awaits as you drive up the narrow lanes and the camping meadow slowly reveals itself. It is a safe place for children to roam freely and explore. 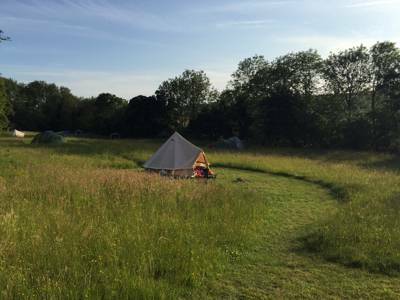 To ensure that you have the space and peace to enjoy your stay here, each pitch is separated from neighbouring campers by wild grass and meadow flowers. We have pitches in both the main camping meadow and in the field below, so there is plenty of space in the 8 acre field. Camp fires are allowed in the fire pits provided. We have built a couple of compost loos on site that are cleaned regularly, as well as standpipe taps dotted around the site for fresh drinking water. The showers on site are in old horse boxes, but other than that you're on your own!